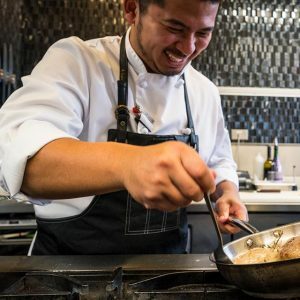 Rupert Garcia, Chef de Cuisine at Oxbow, is a fierce (and friendly) competitor with vast experience at local, national and international chef competitions. Chef Garcia represented Canada and was a Silver Medallist at the International Chaines de Rotisseurs Jeunes Chefs Competition in Durban, South Africa in 2014 when he competed against 20 top global chefs. Chef Garcia has also participated in the Hawksworth Scholarship Competition and supported teams competed at Gold Medal Plates. Born in the Philippines, Rupert moved to Canada in in 2000 and began work as a cook, later enrolling in SAIT’s Professional Cooking Program and became a Certified Red Seal Journeyman. From 2011 thru 2017, Chef Garcia worked under the guidance of Vincent Parkinson, the Executive Chef of the prestigious Calgary Golf and Country Club. Rupert’s exposure to top instructors and mentors as well as his diverse experiences at home aqd abroad has enabled him to craft his own unique style that results in welcome surprises on the palette to the delight of attendees at Chef Meets BC Group as well as his guests at Oxbow.